Starring: Jeremy Ray Taylor, Jaeden Lieberher, Sophia Lillis, Finn Wolfhard, Jack Dylan Grazer, Wyatt Oleff, Chosen Jacobs, Bill Skarsgård, and more. It may be easy to say that ‘It’ is probably the most anticipated horror film of 2017. From the early get go, announcements of this film’s development made fans increasingly excited. Make that a month, weeks, or day before this film’s release? It is safe to say the excitement and hype for this was through the roof. Well now ‘It’ is upon us and it is finally time to see if the film lands among expectations. Even beyond that, it is time to see if the film lands among the Oberrated expectations! Wow… So previously I watched ‘Annabelle: Creation’. If you did not read the review (ehem… Wtf? ), I gave it a 9/10. The scares were well done. I was into the story and it blew the original out of the water. Beyond Annabelle, this year has housed plenty other horror films that have done a pretty good job for the genre. I hold ‘Get Out’ as a shining star of the year but we are now talking about ‘It’, and ‘It’ may very well be the best of the genre for the year. Let us get into a bit more, shall we? The scare factor: My lord… Again, I thought ‘Annabelle: Creation’ did a great job with its delivery of scares but ‘It’ was on another level. Sure, to someone who may watch the film on a surface level, anyone can say “Oh, it was just jump scare after jump scare.” “It sucked”, yeah yeah, ya’ll are the reason I do this job. Anyway, the scares in ‘It’ were phenomenal. Two specific parts were truly my favorite moments but as I sit and think of the plethora of other scare moments, I realize how great they were even if they did not get to me which is not really a shock because I do not scare easily to horror films. Regardless, the way these scares were done were intelligent and terrifying at the same time. Absolutely brilliant. The layers within the story are something to commend as well. Beyond the main plot point of kids vs. monster, there are many subtle sub-points that you could miss if you do not pay attention. Eyes open! A surprising factor to ‘It’ was the comedy this brought. My friends and I were talking about how the film felt constant between scare and laugh. Right when most of the horror scenes would end, a moment would happen that would cause a laugh and not just a simple giggle, but most of the time an actual hard and/or bellowing laugh. I brought up how this could either be that the comedy was actually this funny, which it was, but also that some of the crowd were in a state of panic and had no idea how to respond other than letting out a desperation laugh. No matter the case, the blend of horror to comedy was fantastic and it was much to the efforts of this young cast and especially Bill Skarsgård as Pennywise. ‘It’ is what nightmares are made of. From Pennywise’s mannerisms, to his line delivery, to his monstrous evolution, everything he did was pure nightmare fuel. 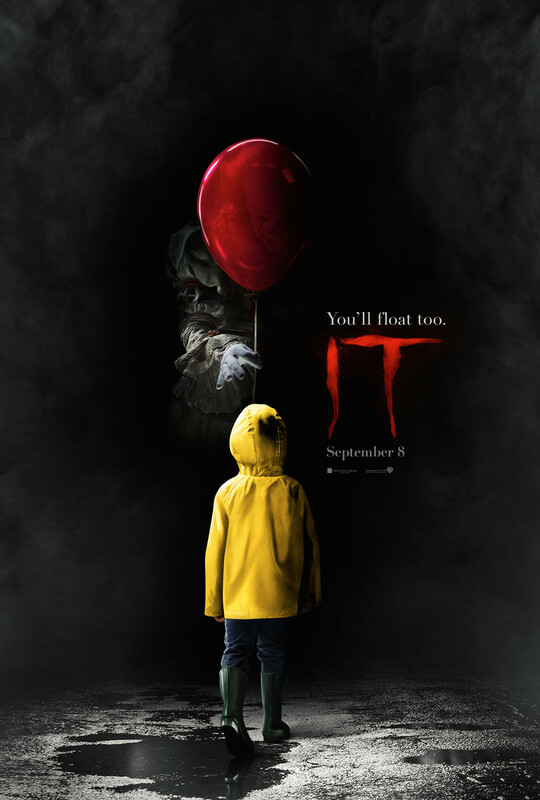 From the easily scared to the stone-faced watcher, anyone watching this film has to have some form of appreciation for ‘It’. Nearly all around, this film is a gem to the horror genre. Easily one of my favorite films of 2017 and as for being the best in horror for the year, I guess I will have to do some evaluating and you will have to wait for my year end rankings to find that out. I can not recommend this film more for anyone even partially interested. If there was a horror film to see within the year, this is the one to see. Posted in 2017 Movies, Movie Review.Tagged 2017, Andy Muschietti, Bill Skarsgård, Cary Joji Fukunaga, Chase Palmer, Chosen Jacobs, Finn Wolfhard, Gary Dauberman, It, Jack Dylan Grazer, Jaeden Lieberher, Jeremy Ray Taylor, Movie Blogger, Movie Reviews, Movies, Pennywise, Sophia Lillis, Stephen King.